Welcome back to Part 23 of The Accidental Remodel! 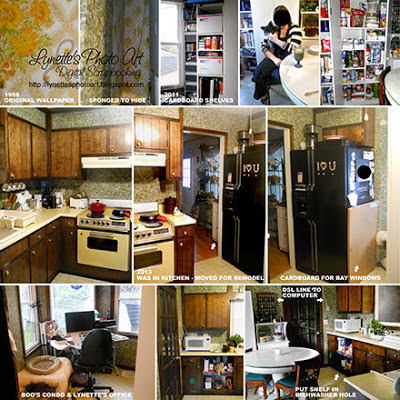 Thanks for dropping by to share the next installment of our ridiculously drama fraught kitchen remodel. I have to stare in disbelief at all the trouble we've had with the granite counter people first, then the electricians, the ATT phone service people and the cabinet man. It is truly ridiculous! Thank God I've done all the work myself that I remotely could. So, for any new comers here, this all started when we had to have our cabinets cut to fit a standard stove. That's what started the Accidental Remodel. We paid the same cabinet man FIVE MONTHS AGO when he did the stove work. We don't normally pay up front, but he insisted he was fantastic and so in demand that he wouldn't even put us on his list without the money. He didn't give us a date, but a month the work would be done by. Once I was painting and tiling the backsplash, I saw that he had done the stove opening wrong, but it was too late. We had already paid. The tiling made one of his errors very noticeable and permanent. He is a very abrasive person and spoiling for a fight. Very combative and unpleasant. After all these months of not returning our calls and not keeping dates, I had tried to reconcile myself to the probability that he would never do the work he contracted to do. The contents of much of the kitchen had urped out into the rest of the house for the remodel and made life very challenging all these months, and made DH really grouchy. Well, surprise. He turned up at my door today. I was so grateful. First know that I was exceedingly detailed and specific as to all aspects of this job. The workmen today had it on their clip board. I left no room for misunderstanding and we went over every detail with him several times in person months ago. I even provided him with drawings and photos. The basic "boxes" of the cabinets looked ok and sturdy as they brought them in. I was sooooo happy! But they weren't the sizes they were supposed to be. The shelves looked "ok" but were too short so they all really have big gaps at both sides and move a lot. Then it got worse. Everything other than the basic "boxes" were horribly wrong. He committed to match my existing cabinets. He even had one of my doors and a hinge to match, which also didn't match. Not only do the hinges not match, but they didn't even install them even with the existing ones. Doors and drawer fronts aren't even with the existing ones. The door and drawer fronts were very thin junk wood and not the 1/4" thick they were supposed to be like mine. That gets more important when you know that my pantry is fllor to ceiling with doors that run the entire height. Inside the doors, on the hinge side, it looks like a beaver has been chewing on both doors all the way up and across the tops. Huge gnarly damage and then chunks of some kind of white plaster or something all inside the door panels. The doors don't even close. They are sticking out away from the case at the top and the bottom! Super light weight. The door and drawer fronts were to have lines routed in the front to match mine. The lines of the drawers above cabinet doors are over 1" off from matching. I am going to have to patch the grooves, sand and paint the drawer fronts smooth like there aren't any grooves. Even the edges of the cabinets and drawers don't stop and start at the same places or levels on the case. The three drawers they installed are very flimsy and none of them roll in and out properly. Even after me pointing out that one won't pull out till the 4th try each time, it's still the same. The style of the doors and their sizes are all wrong. They do not match the existing cabinets at all. They were to have styles that showed between doors. There are none. He was to make all the lower cabinets to have a half shelf in back and removable shelves to make them into full shelves coming to the door, independently removable so that one door could have a full shelf and the other a half shelf if desired. Their answer for every issues was, that's all they had. The new upper cabinets were to be the same depth as the pantry, but it isn't...by a couple of inches. The opening between upper and base cabinets is so uneven that for me to continue the tiled backsplash would make the unevenness even more noticeable. :( At one point they accidentally pull a big piece of my newly painted wall off. They Elmer's glued it back down! They pulled all the newly painted trim off the top of my old cabinets to put up my much anticipated crown molding. I'd been dreaming of my first crown molding for months. Couldn't wait to paint it. Well, not only did he not do all the above things he contracted and was paid to do, and more, but he left me with the torn up tops to all my cabinets and no crown molding. They were to remove the panels above the existing cabinets and make shelves there so I could put baskets in those openings. When they did the one over my sink they found the electrical cords a problem and he promised to add length to the wires so they could be put at the back wall to allow the baskets. Nope, left that too which prevents me from being able to put my baskets there. I had them rout grooves in the shelves that are open, to stand plates in for display. Oh how I was looking forward to that! I even gave them precise measurements of the depths of the plates. Wanna guess? Yep, the grooves are so far apart that it's a complete fail there too. And to make it worse, the section where he drilled holes for adjustable shelves in the cabinet that is open for display, one of the back rows of holes is off, so when I set anything on a shelf, the front opposite corner kicks up making a visibly crooked shelf...for every shelf! I hadn't said one thing about any of the things that were being done wrong. I spent the day praying and telling myself I could live with it and that I was just grateful to get it done finally. I kept reminding myself it's just a kitchen, just money (though very big sacrifice for us that we had a right to expect to receive the quality product we contracted for). Tons of things not done to our agreement. Literally everything outside the cases done horrifically and obviously wrong. Cheap and flimsy. It's heartbreaking. Especially after FIVE MONTHS of waiting. He had left the house with the others doing the work. They started putting up tiny 1 1/2" molding at the ceiling. I said it was supposed to be crown molding. They said that's all they had. They called him about it. They gave me the phone and he screamed at me for a long time and hung up on me. I feared that he'd just tell them to stop and leave. The men felt terrible. One was his son and the other had worked for him for 20 yrs. He said he always does this. He tried to make the wrong doors and such work, but the stuff just wasn't there and he said they would not be allowed to return, so refusing it and demanding it be done right was out of the question. It's horrid and I can't even use my drawers and they are so flimsy. In the end, technically they did most of the work that that could, even using some of my own wood. But they did leave me with this horrid job and undone work I have shared with you. And the shelf they ended up putting over my sink they put in extremely slanting toward the opening as well as with the wires in the way. To top it off, he had taken one of the doors I had refinished, supposedly to make the new ones match it, and he brought it back which chips missing, scuffs and other damage. This has not been a good experience. I feel so beaten up. You know, the web is full of beautiful before and after stories of make overs. I have never seen one that went like ours. I'm sure many people have had the stray screw over, but really, by every single company they deal with? I'm resolved to be grateful and not get bitter. I truly praise God that He's helped me to not get angry through all this and to stay calm and forgiving, but wow! And this cabinet guy loudly touts himself as a faithful Christian. So sad when people do that. If you are going to do horrible work and abuse people, please don't shame our Lord by claiming to be His. Seriously. And no, they didn't do anything to fix what they did wrong with the stove opening. Is there a lesson here? I spelled out every detail complete with measurements, diagrams, you name it, to be sure there was no misunderstanding. I went over it with him several times in person and using the kitchen as a physical example. He said he understood. I gave him printed copies of everything. He agreed to the work. What else could a person do? So, sadly I don't know how one could have better protected themself. I'm open to suggestions. Since this has happened to us EVERY time we have ever had to hire another to work in our home, I'd certainly like to know how to stop this in the future. And yes, I do look for Better Business reviews first. Neither of these men were members so there was no info, but the site emphasizes that just because they aren't members doesn't mean they don't do good work. Another issue on my heart is reviews. I will not do anything to hurt another or to be vindictive or any such thing. Even if they harm me. But, if someone had told the truth about either the granite guy or this cabinet guy, we would never have used them. Remember, the one man has worked for cabinet guy for 20 YEARS and said he's always done this. If anyone had reported him, the rest of us might have been spared. So, though I don't want to do ill to another, other Lynettes are on my heart, that I could help them avoid the hell I've been through with these two men by telling the truth and naming names. But, while I have pondered this for months in prayer, my husband tonight says no. He is concerned that they might do us legal damage if we tell our story publicly using their names. I will submit to him as he is the head of the house, but my heart is heavy for other Lynettes who will surely fall victim in the future. If no one takes a stand, the carnage continues. I consider it a community service to others. What is your take on this? So, I'm going to pick myself up by my boot straps and make the best of a very bad situation. Just wish it was sturdy and functioning as a minimum, but we all know that's not changing. I'm too depressed to post pictures this time. Anyway, it looks better in pics than in person. 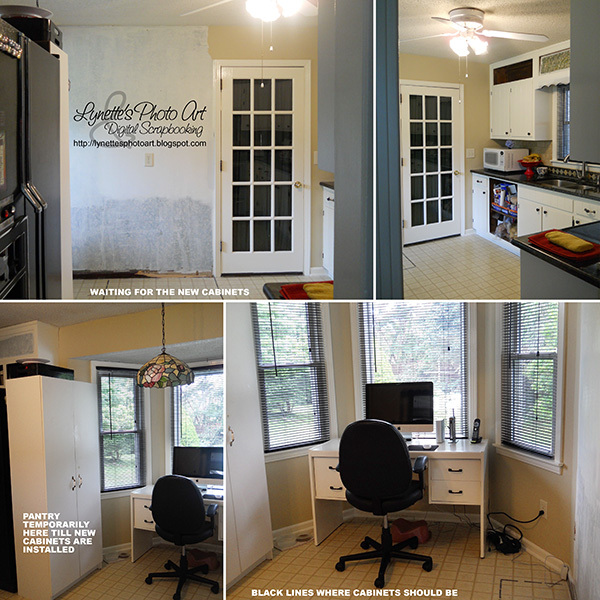 I hope you'll drop back by as I share this very real life remodeling experience with you! Full of the nitty-gritty! You are a bright spot in all this! Thanks for joining me and all hugs are welcome! Ok, one pic showing you the quality of the work...can you believe this? Welcome back to Part 22 of The Accidental Remodel! I've been working on this part of the remodel ever since it began in March. It's proven veeeeery challenging! LOTS of shopping! Ok, here's the deal, we have an old kitchen, the kind with the panels that do nothing above the cabinets. My plan was to knock the panels out and make them into shelves. I originally I planned all matching woven baskets in all the shelf openings. That proved to have two problems as time went on. One was that as the remodel progressed, it was turning into a very cold and modern room, and that wasn't want I wanted. The "all matching" containers in the shelves would only further that dynamic. The other problem was MATH! Clearly, the dimensions of the shelf openings are limitations. I need containers less than 9" tall, less than 11" deep (from the front of the cabinets to the wall), and each section is a different length. Because of the varying lengths to fill, "all matching" was out. I knew that putting containers above all the cabinets would be pricey at best and I need to keep the price down. I also didn't want dust being a problem as I hope to put my Christmas decorations in the containers. No more attic - yeah! And only a step-ladder twice a year (once to get them down and once to put them back). So, covered containers sound great. Some space between containers is fine, but too much looks horrid. It's a puzzel of styles, shapes, colors and sizes. Since I don't have the shelves yet, I can't try them out and shuffle till it's right. So, I took masking tape and measured it out on the floor for each section. That enabled me to "test" layouts on the floor in front of each section of cabinets. I also took photos them and PhotoShopped them into photos of the remodel in progress to give us an idea of how it might look. One problem I ran into right away was that the discount places I shop locally only get a couple of any one style at a time, and when they are gone, they're gone. Another problem is that most are being sold in nesting sizes. I need all close to 9" tall and no deeper than 11". That didn't work. I realized that to get matching containers in the volume I need, I'd have to order somewhere. Nothing at Target or Walmart. When I googled on line, I still couldn't find what I needed and oh the prices! I started really trying to open up to alternatives as Plan A wasn't working. Ok, the basic objectives were size, price and covered - hopefully. I looked into canvas bins, baskets, the boxes and chests in stationary departments. I even looked into cardboard boxes I could cover with scrapbooking paper, but couldn't find the right sizes. Since the shelves haven't actually been made yet, I need to be careful to buy only returnable local items. Since it's a buy it or loose it deal at Home Goods, I have bought now and am saving receipts. You can only get a store credit after 30 days, and since cabinet man hasn't set any date, I am expecting a sizable store credit if/when he actually does what we paid him for. The first thing found that might work was large boxes in the stationary department. There weren't enough of the right size that would match, and in fact were hideous. That meant not just the cost of buying them, but then products to alter them for the room. I came up with an idea. I had wanted to print my favorite black and white images (mostly ones my daughter has taken; she's so gifted!) and put them in a row of square black frames of the overhang above my bay window. DH nixed that, so it occurred to me that I could design the sides of the boxes in PS, print and attach them and I could still have my b/w pics! I experimented spray painting one of the boxes, as I'd need them all black so the edges would show black and all match. After several coats of paint, it held up pretty well. Then I spent many, many hours converting my favorite images to b/w works of art and then designing the four sides of eleven boxes to print. I took the graphics for the first box to Sam's to print as a poster, then cut apart and apply. Their equipment was broken. As I could go no further, I decided to do a mockup of how they would look in the room. I was so excited. I thought it would look fantastic. Sadly, it made the room all the more "modern" and to me, colder. :( Plan B scrapped too. So we shall see what we shall see! Thanks for dropping by and I hope you'll join me for the next step in our Accidental Remodel! I have always adored Nikko Blue Hydrangeas. This year I saw a beautiful wreath made with dried blossoms. I have two huge bushes. I've never tried drying them, but I love them so, that now I just had to try! I searched the web for how to do it. I found lots of different ideas. The exciting thing is I read that if you keep them out of moisture and direct sunlight, they "last indefinitely"! Awesome! All the directions had a lot in common. They said to pick them when they were at the end of the blooming cycle and had changed colors. As I have Nikko Blues, mine turn lovely greens and pinks, and occasionally a little white. Remove all leaves and cut fresh diagonal cuts on the stems. Leave plenty of space between blossoms so air could circulate freely and keep them out of direct sunlight. Method one: Put them in 4" of water, then leave them alone for two weeks. Method two: Do the same as above, but this time add some glycerine to the water. Method three: Do the same initial preparation as above, but this time don't add water or glycerine. Just set them in a dark room. I tried all three methods. Method one: After about two weeks, some of my lovely blossoms dried nicely this way. Some shriveled and turned brown and were tossed. Some kept their shapes, but had parts that turned brown and the rest stayed lovely. Method two: This was not a happy time. Almost immediately almost all of them turned brown and started to smell. Some kept their shape, but they turned almost entirely brown. Two weeks later they aren't fully dry yet. Method three: Duh. The easiest of all hands down worked the best! No water. No glycerine. I had done the other two batches on my dining room table, out of the light and with lots of room around each blossom. With my table still full of those, I had to think of somewhere else to dry this last batch. We have converted garage attached to the house. It has no heat or air except when we open the kitchen door for laundry or something and it's dark. I simply laid them gently on the sofa and love seat with plenty of room around them. Because the other methods have taken so long, I didn't think to check on them till the third night, tonight. Guess what? They are all dry already! Only tiny spots of brown on a couple and the color and detail is peeerrrrfffeeect and no odor like with method two! LOL Of course it's the easiest way that worked best! I had an idea to save the blossoms that kept perfect shape, but had some brown spots on them. I used Krylon Chrome spray paint and gently sprayed only the spots that were brown. 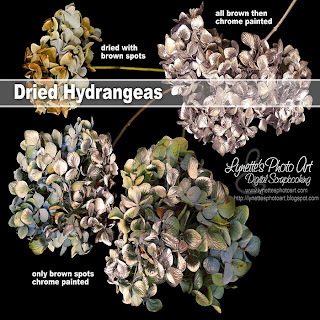 The over-spray made a delicate gradient to the natural dried colors. They are utterly gorgeous! There were a couple blossoms that had a lot of brown, but perfect shape, so I sprayed them entirely silver. They both mix in great with the all natural blossoms. Aren't they gorgeous? I can't wait to make something with these amazing beauties! For blossoms that turned entirely brown, but kept their shape, I took the paint a step further. I added a couple of colors to the Krylon Chrome. I used Krylon Pistachio and Ivory, both in satin. They are perfect matches for the dried colors! I covered the blossoms with one or the other and then used the other and the chrome as light touches here and there, some on the fronts and some on the backs of the blossoms. I'm going to get a blue too that will match the dried natural blue and then they'll be GREAT! The clusters I've painted so far look amazing and all the more natural for the variety of colors on them and I love just the lightest touches of chrome here and there. These are simply breathtaking! Hope this inspires you to try saving these delicate gems God has blessed us with! I just know there are uses for them in our homes. Thanks for dropping by! We got this box in a game at the church Christmas party a couple of years ago. It wasn't to our taste, but it's a wooden box, so I couldn't discard it. Today I got an idea for making it over and I love how it turned out. Even better, it cost $0!!! I was shopping at Marshall's about a year ago and noticed this elephant gift card. I fell in love with it and bought the gift card and then used it to pay for my purchase, just so I could have the elephant. He is amazing! That started me collecting gift cards that I found truly beautiful. I kept thinking that "someday" I'd find something to use them for. Well, today was the day! I thought it could look good standing up in an arrangement on the new piece of counter, if the cabinet guy eeeevvvveeerrr does what we paid him for last March. I decided to paint the box the shade of red that I'm using as an accent in our kitchen. I popped the seasonal panel out and removed the rope, but only a couple of the screws would come out to remove the hardware. Some of it must be glued on too. This is the "Useful Tip" I promised you - I really didn't want the paint to be on the cute little hardware, but I couldn't remove it. I put my thinking cap on and ended up very carefully painting a thick layer of Vaseline on every bit of the tiny hardware, edges too, using a toothpick. I didn't know if it would work, but after the spray paint had dried enough so I could touch the box, even though there was paint on the Vaseline, they both wiped right off with a paper napkin, easy as pie! It did a perfect job of protecting the hardware and not interfering with the wood taking the paint. Six gift cards fit it perfectly! I painted the seasonal panel black as the gift cards have rounded edges and the tiniest bit showed through when I laid the gift cards out on it. It turned out that once I had assembled it again, the frame hid the edges, so I wouldn't have had to paint it, but I for one feel better knowing that design is gone forever! After the black paint on the panel was dry, I put a strip of double sided tape down the middle of the length of it to secure the cards. 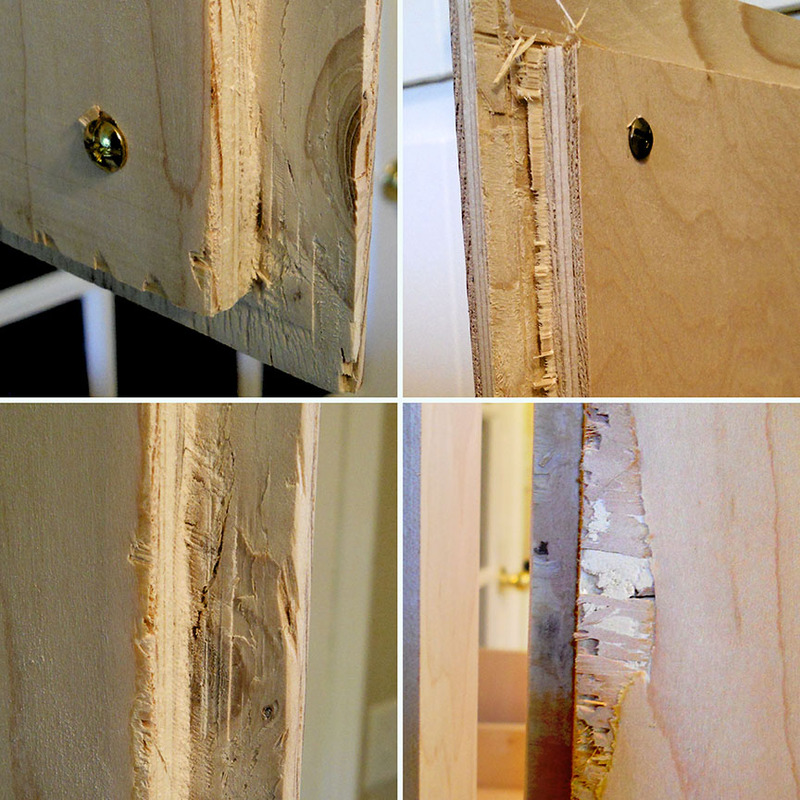 They only needed a temporary hold until they were snug between the frame and the panel. I arranged the cards on the panel and just pressed it into the frame. Replace the rope and voila! I think it's a very fresh and unusual look and I finally get to see my elephant out and about the house! :) Isn't he gorgeous? And what fun that two things I've been saving, sure that one day I'd find a use for them, have finally come together in a colorful and happy project! And it was so quick and easy! Each of these cards is a happy memory for me. I wish I'd had room for more cards! Another fun things is that since I love Christmas decorations, I could easily change these cards out for Christmas store cards for the holiday! Yeah! If you are following along on the kitchen remodel, I plan to share the final look when it's all done and we'll see if this pretty box ends up in there or not! Thanks for stopping by and I hope you join me for the rest of The Accidental Remodel! Welcome back to Part 21 of The Accidental Remodel! Wow! At this point there is nothing left for me to do but wait for the cabinet guy. The only thing I do need to do is repaint the walls (remember the "flat" debachel? ), but experience has taught me I'd be smarter to wait till the cabinets are in and skip the touch up. We'll see if I can just "wait" until/if the cabinet guy actually does what we paid him for in March. I might end up painting out of sheer frustration! At midnight last night I got up, unloaded the MDF pantry and moved it out of the way, then reloaded it. This morning I removed all my work things and mopped the floor. At least it's less crowded now! The black tape on the floor is where the pantry and cabinets are to go (I hope, I hope, I hope!). It's actually been helpful in many ways to have that tape there for my planning. So, here's where we are now! We are so ready to be done and return to normal life after so many months! After the cabinet guy does his work I still have to prime and paint (many coats) the new cabinets, get another piece of granite countertop and have it installed (praying it goes well this time), try to remember how I tiled the backsplash and do it again, then repaint the walls with a NOT flat paint! :) We've come a long way, but a long way still to go. My husband is in love with the change and that's so nice. Come cabinet man and do your part! Please! Today's my birthday and I have such a fun project for you! 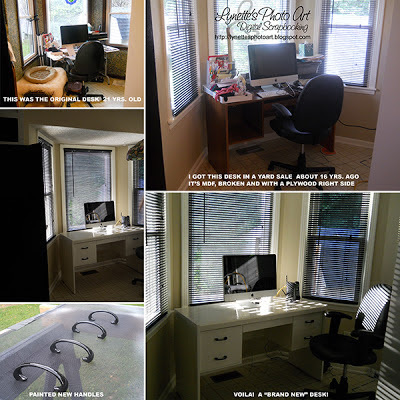 I've seen so many wonderful projects on line done with Krylon's Looking Glass spray paint. I have been so excited to try one of my own. I actually bought the paint over a year ago and have just been waiting for my own special idea, and today was the day! Though I'm in the midst of The Accidental Remodel, today there was nothing I could do on it and I got an idea of something I could this on. 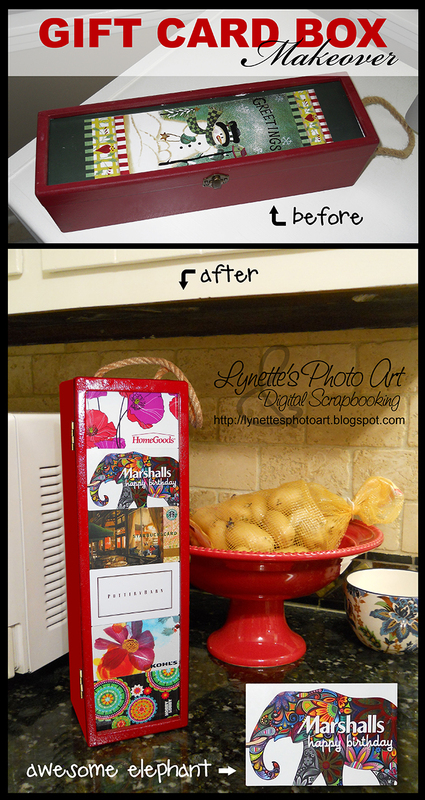 I love re-purposing things. We went through a few years where we couldn't keep a microwave for more than a year. It was horrid and so expensive and wasteful. On the last one, I saved the glass turntable tray. There are so many uses for a large, sturdy round piece of glass with a lip on it and they are expensive to buy. I felt sure one day I would have an idea for how to re-purpose it. I did the faux mercury glass treatment on the back of it. I did many light coats of the paint along with sprays of 50/50 vinegar and water that I'd then wipe and blot off gently. 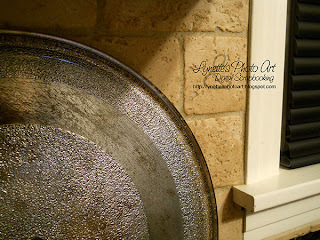 I even used a scratchy pad at one point and love what it added to the finish. My favorite part is where the underneath was very textured. It sparkles like diamonds while the flat parts are partly transparent and mottled and scratched. I love how this turned out so different from others I've seen. Love this product! This would be pretty standing vertical on a shelf or counter or as a base for a large pillar candle. You could use it to serve appetizers or deserts on, as the paint is only on the back. Maybe with a stack of old books on it sprinkled with acorns and pine cones. Isn't that gorgeous, even though it's difficult to photograph! If you haven't gotten to try this paint, I hope you dive in and have a ball too! Don't forget to stop by for the next installment of The Accidental Remodel! The posts are behind where I actually am and it's starting to take our breath away! Welcome back to Part 20 of The Accidental Remodel! I thought of spray painting it black. I thought that might make it co-ordinate with the rest of the countertops and hardware. But all the cords and the black power-strip would still show and look so messy against the newly painted walls and trim. Then I thought that would make the bay even darker and wondered how it would look if I made just the top black and tried to paint the legs to match my trim color. But the mess would still be so obvious. So, I did what so may other bloggers have done - I shopped my house! I had an old MDF desk I'd bought at a yard sale about 16 years ago. 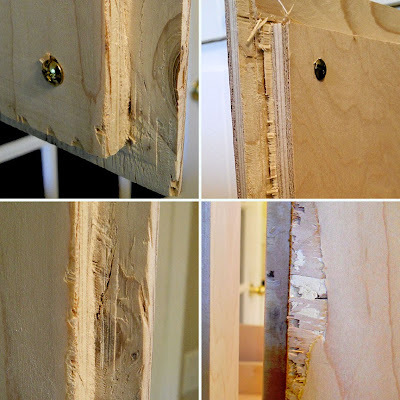 The trim was broken off and one side was plywood, but at that time we were starting over with nothing and it was affordable and serviceable and I bought it. I drug it into the bay to see if it would fit and try it out with the computer in mind. Everyone cringed and hated it, but I thought it might work, so out came the primer and paint! I bought little L brackets to replace the broken plastic ones and put the trim back on, fixed the drawer and painted it to match the cabinets and trim. We are starting to think it might look very nice when the new wall of cabinets are in and painted! The handles were a problem though. There was 3 1/2" between the holes for the ugly chunky wood handles I threw out. I needed to stay black to make them work with the rest of the hardware in the kitchen. I now know I can spray paint them with success, as we've been living with the knobs and hinges I painted for several months now and they are still perfect! But I didn't want to if I don't have to. There wasn't anything at our Lowe's or Home Depot. I have looked on line, but comfort is important to me and I'd really rather be able to try them out in person. I ended up picking these unusual shaped and very comfie handles from Lowe's, even though the distance between holes didn't match. They were a gorgeous brushed nickle, but of course, I had to paint them black. I was anxious because I would have to drill new holes for them to work, so there'd be no turning back. Nervous!!! My favorite part of having the desk in place is how the blackout mini-blinds cast amazing shadows on EVERYTHING! I was going to wait the full seven days for the paint to have "maximum strength" like the can said, before putting anything on it, but with the electricians today, it was unavoidable, so with five days to cure, I'm working at the new desk for the first time tonight. :) All my mess is finally out of sight! Sadly, my printer and video transfer equipment doesn't fit though without making my monitor way off to the side from where I have to sit. So, they will have to sit sideways on one side when I'm going full swing again, but, for now it's oh so pretty!! !